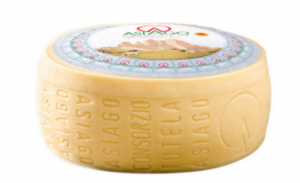 Asiago Fresco signifies the dairy tradition as it exists in the Asiago Plateu between the Veneto and Trentino-Alto Adige regions. The cheese began as a sheep milk cheese around the tenth century, with the cow milk version becoming increasingly common over subsequent centuries. PROFILE Light, but buttery with a moderate lactic spike.